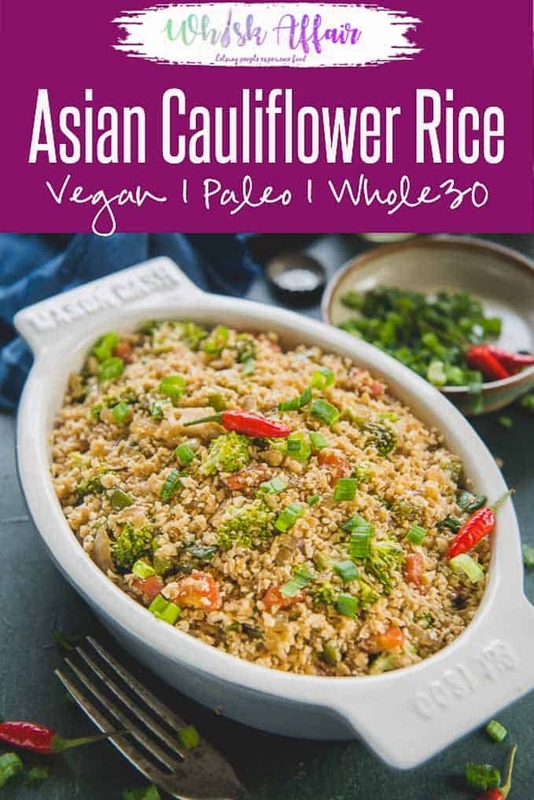 Asian Cauliflower Rice is a delicious recipe which tastes just as good as your favourite Asian style fried rice. The best part is that it’s healthy, Keto, whole 30, low carb, paleo and vegan too. 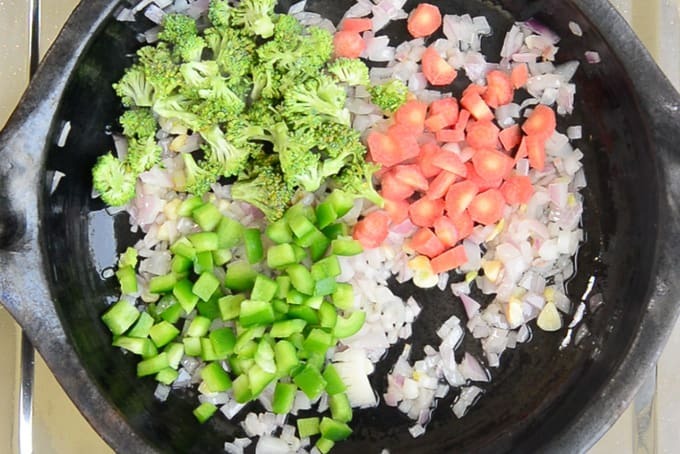 Here is a video of how to make Asian Cauliflower Fried Rice Recipe. Is Cauliflower Rice Good For you? Cauliflower have 25 calories per cup of serving as compared to 215 for a cup of rice. It is loaded with fibres, vitamins and mineral and is in fact one of the healthiest vegetable. Making this rice using cauliflower gives you access to all these good things. Does Cauliflower Rice taste good? To be frank, I was a little skeptical about the taste initially, but one spoonful and I was in love with this concept. This rice does not taste like the regular rice but it tastes good surprisingly. In fact it taste very very good. You have to try it once to believe it. This is all I can say. 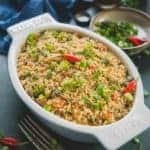 How to make Cauliflower Fried Rice without a Food Processor? 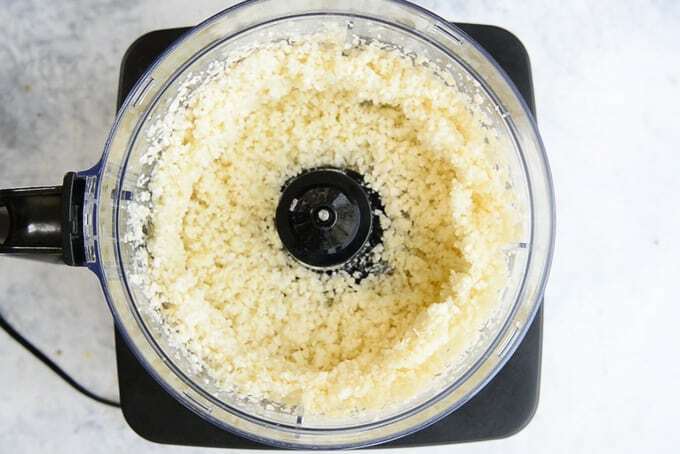 If you don’t have a food processor, you can make cauliflower rice using a grater. Use the medium grate to grate the cauliflower and then use it in the recipe. Can this rice be frozen? This rice can be very easily frozen. So go ahead, double the recipe and freeze it for later use. Just thaw it on counter for an hour and then microwave until warm before serving. Some stores have started to sell readymade frozen cauliflower rice. So you can pick that as well if you want the process even more fast. 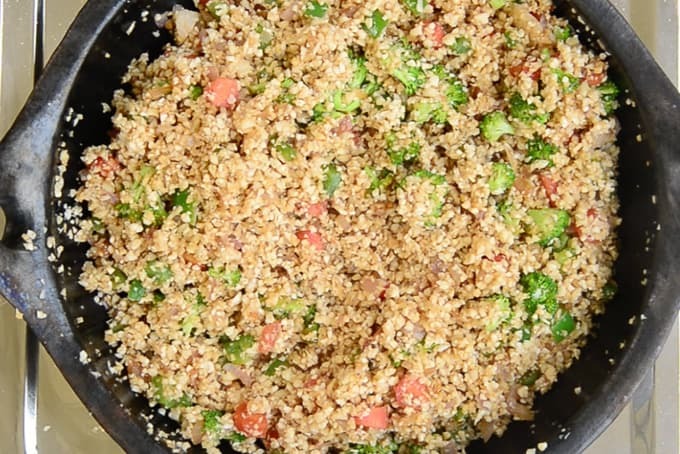 Use a food processor or a grater to make the cauliflower rice. Using these will ensure that the result is rice like and not a paste of cauliflower. You can add Shrimps, shredded chicken or eggs to your rice if you wish to. 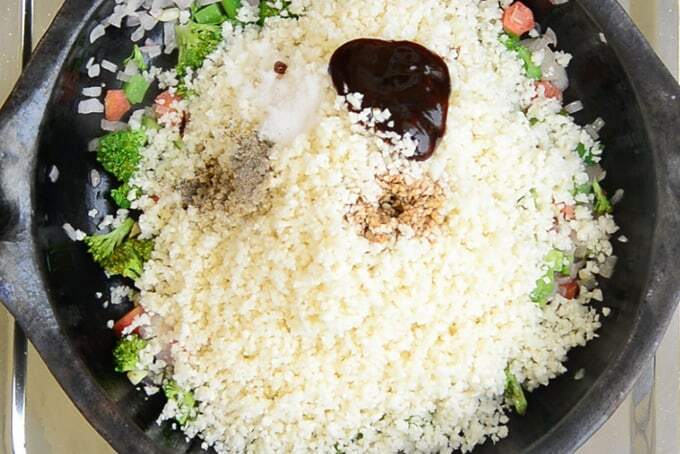 You can add veggies of your choice to this rice. Try adding corn, peas, capsicum etc. Increase or decrease the amount of sauces according to your taste. To save time, you can rice the cauliflower in bulk and freeze it in mall batches and use whenever needed. 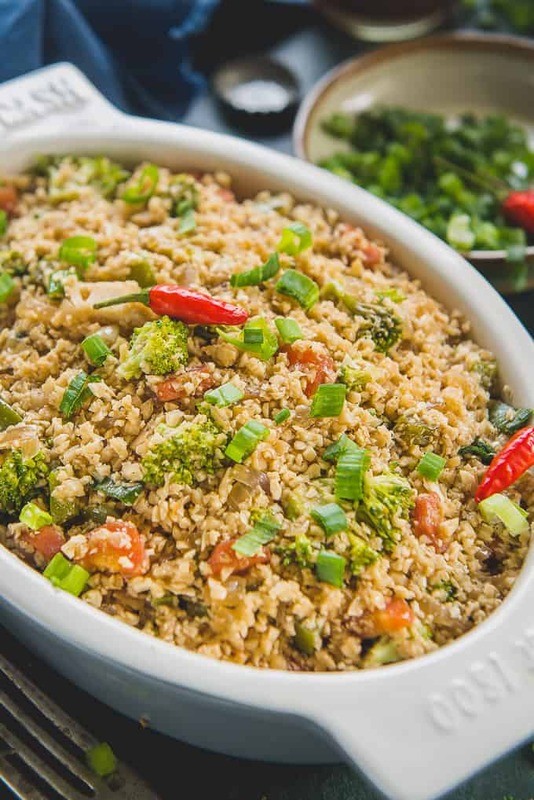 You should have a food processor or a grater to make cauliflower rice. Wash the cauliflower and cut it into pieces. Add the pieces in a mixer and grind to make a coarse mixture. Heat oil in a pan. Once the oil is hot, add garlic and fry for a few seconds. 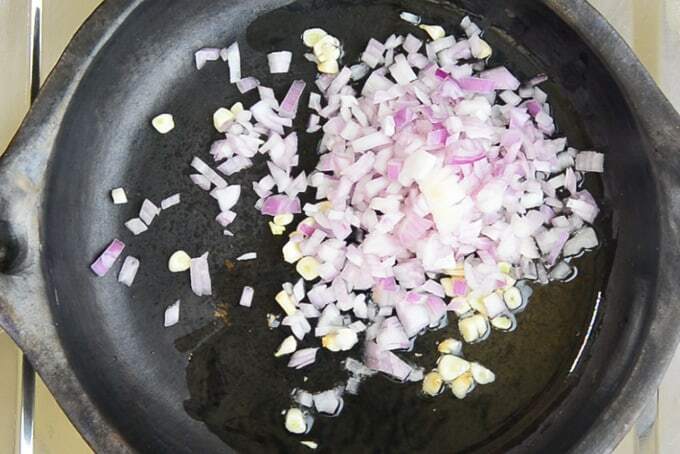 Add onion and fry for a minute. Now add carrot, capsicum and broccoli and fry for another minute. Add the ground cauliflower, salt, black pepper powder, soy sauce, oyster sauce and vinegar and mix well. Cook for a minute. 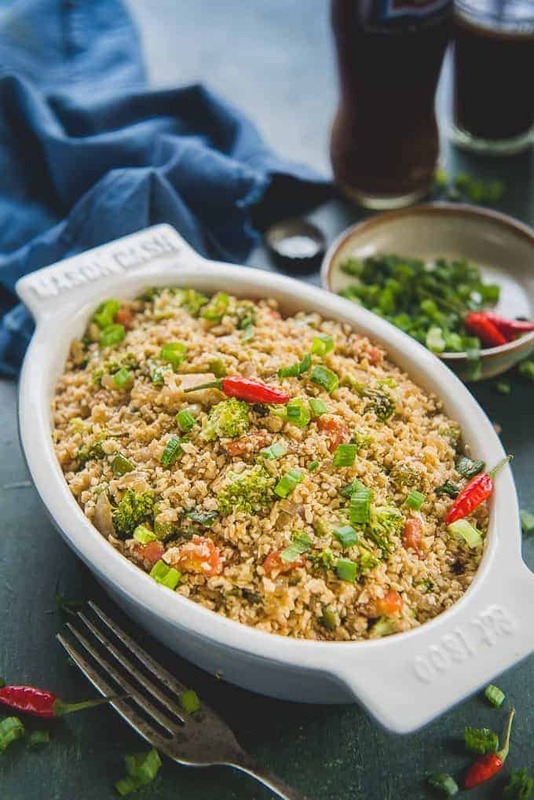 Healthy Asian Cauliflower Rice is a delicious recipe which tastes just as good as your favourite asian style fried rice. It's gluten free too. 2 tsp Dark Soy Sauce Use Tamari for gluten free version. Wash the cauliflower and cut it into pieces. Add the pieces in a mixer and grind to make a coarse mixture. 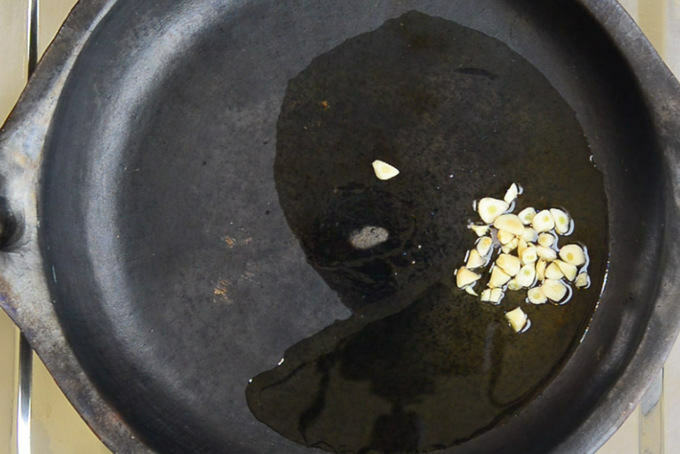 Once the oil is hot, add garlic to it and fry for a few seconds. Add carrot, capsicum and broccoli and fry for another minute. Now add the ground cauliflower, salt, black pepper powder, soy sauce, oyster sauce and vinegar and mix well. Serve hot with any Indo Chinese style gravy. Just wanted to point out that oyster sauce is NOT vegan, so this is not a vegan recipe. It looks good otherwise though!